I’m a planner. I love organization. I owe my place in the music world to the fact that I know my way around a spreadsheet. So after 27 shows, it was a challenge to embark on our first event of 2018 in a brand-new location, but I had a plan. We’d be in my new office, so I could spend the week before the show getting everything ready, working out the acoustics and lighting, and ticking off every box on my checklist. By Saturday night, I’d be all set! After a flawless sound check, Hadley Kennary opened her debut Memphis show and quickly realized that the P.A. was acting up. Some helpful guests and I tried to troubleshoot, but ultimately, we decided it would be best to just unplug everything and do an extra-acoustic first set. Hadley set up on the couch and the guests pulled their chairs closer. The lights were in the wrong spots. The sound was barely making it past the back row. Yes, Folk All Y’all has become a kinda fancy public performance series over the last few months, but we’re still throwing house shows at heart (I still have to catch myself when I call concerts that), and having everyone huddle up to listen to an incredible artist share her work in the most intimate setting possible was a reminder of that. There’s a different connection that happens when there’s nothing between the musician and the listener. 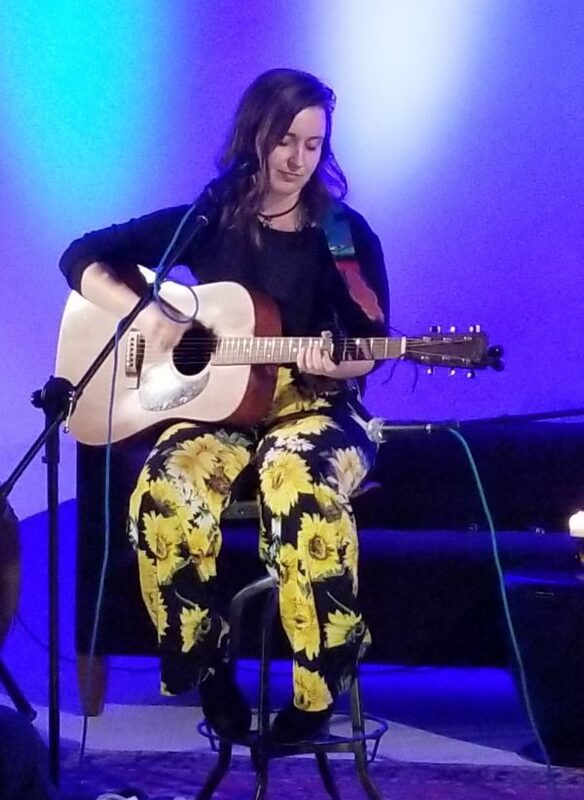 Hadley is getting established in Nashville and most of our guests came to the show on faith with little prior knowledge of her work, but by the end of her first set, she had a room full of new fans. Of course, I had to give my original vision a shot. I spent the set break setting up new mics, re-setting spotlights, and getting ready for a Dylan-esque electrification. Serendipitously, the second set featured more of Hadley’s newer work, appropriately highlighting her ongoing evolution. Although the vibe was a little different, it was no less powerful. You could have heard a pin — or one of many unexpected tears around the room — drop during her performance of “24 Hours,” a waltzing ode to the magic of finding someone who not only accepts your differences but delights in them. It’s that exposure to the unexpected that makes life rich and surprising and wonderful, and our show with Hadley was the perfect example of how beauty is in the spontaneous. Sometimes things don’t go quite as we plan, but through care and connection, they turn out even better. 100% of ticket sales for each show go to our artists. Yep. All of it. So if you want to help produce these shows and get access to behind-the-scenes extras and merch, become a patron for as little as $2 a show. Or just buy stuff! Or donate directly!